Most people probably remember Die Another Day as the James Bond movie with Halle Berry in it. I remember it as the one with the horrible Madonna song. But really it should be remembered as the 007 movie that barely improves on the The World is Not Enough mess. I always forget how bad this movie actually is. After watching Denise Richards you’d think Halle Berry would be an instant upgrade, but she’s not that big of an improvement. It was nice to see a non-white actress teaming up with Bond. Other than that her inclusion seems like a bit of stunt casting. Berry was already an established actress before Die Another Day, and Bond girls are typically much less famous when they make these films. Because Berry was really famous the role seems beneath her, and she plays it that way at times. (She did win an Oscar while filming this, so maybe at that point she thought it was beneath her?) Her character is tough, but a tad boring. If it weren’t for the now famous shot of her emerging from the ocean in an orange bikini I doubt most people would remember her in this at all. As for the title song… ugh. I mean I like Madonna, but exclusively 80s and early 90s Madonna. You know, the Material Girl and Vogue years. This techno-pop stuff is not my cup of tea. It also doesn’t fit in with the whole Bond franchise, in my opinion. Duran Duran’s “A View to a Kill” is as “pop music of the time” as I want my 007 tunes to get. Otherwise, I really just want to hear songs that I can imagine Shirley Bassey singing. The story itself is OK, but nothing truly special. It trends toward the weirder, more outlandish Bond plots, featuring extreme plastic surgery, a satellite that basically functions like a magnifying glass and fries anything in its path, and an invisible car. There are some cool sets (an ice palace!) and I liked that James Bond is actually caught while in the line of duty for the first time (though watching him get tortured to Madonna’s tune makes for the most depressing main credits sequence in the series). Die Another Day was released to celebrate Bond’s 40th anniversary, so there are also references to all the previous films in the franchise. As a fan of the series I got a kick out spotting old Bond gadgets in Q’s warehouse, but the scene also reminded me that this movie is nowhere near as good as some of the originals. Oh, this is also Pierce Brosnan’s last outing as the debonaire spy. He’s good in the role, but never reaches the heights of Connery, Moore, or Daniel Craig. In most of his films (and especially in this one), he feels almost like a secondary character. Brosnan never fully feels like James Bond to me, despite his good looks and genuine humor he injects into many of his scenes. The final Bond movie that starred Pierce Brosnan was released to mark the 40th anniversary of Dr. No, Bond’s first cinematic adventure starring Sean Connery. More was made about the fact that big star Halle Berry was going to be a Bond girl than anything Brosnan might have been doing. Die Another Day is good, but it does feel a bit forced with too many moments to distract the audience from the fact they are watching a Bond film. Berry is already an established actress when she was cast, and her big name distracts from Bond, and as a result of her star power, she is given far too much screen time. I also had a problem with the appearance of Madonna. The songstress performed an average title song for this film and also shows up as a fencing instructor. Her appearance is clearly stunt casting and detracts from an otherwise solid Bond film. The film opens in North Korea, Bond (Brosnan) is attempting to trade some African conflict diamonds for some illegal weapons and bust the people involved. When his cover is blown, Bond is taken hostage and tortured for nine months. Only a controversial prisoner trade gets Bond his freedom. The British spy is determined to discover who blew his cover in North Korea, as it was likely an inside job. His journey takes him from Cuba, where he meets mysterious CIA agent Jinx (Berry), to Iceland, where, with the help of Jinx and fellow MI6 agent Miranda Frost (Rosamund Pike), he takes down a British billionaire (Toby Stephens) who is now in possession of the conflict diamonds Bond wanted to trade during the opening scene. Can Bond discover who the MI6 mole is before his cover is blown a second time? This is a fun film, I feel like it is unfairly criticised. People complained about the ordinary graphics and the dodgy gadgets, but I did not really have a problem with any of that. The invisible car is pretty cool, even if it is completely unrealistic, but if you came to Bond looking for realism, you are going to have to wait until Daniel Craig takes over. My biggest problem with this film is the stunt casting of Madonna and Halle Berry. Madonna is there purely because she is Madonna and she is a huge distraction the film does not need. Halle Berry is less of a distraction, but she actually received her Oscar half way through filming this film, and you can almost see the moment where she starts to think she can act. She should know that a Bond girl is expected to be not much more than a bikini model, acting talent is not essential, especially if you don’t have much of it, despite receiving an undeserved Oscar. 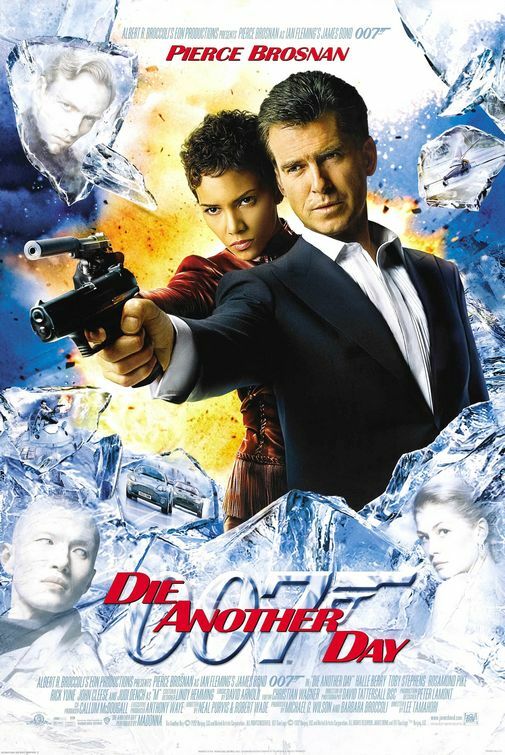 Die Another Day is a fun film, let down by stunt casting. It wraps up Brosnan’s time as Bond with an exciting adventure, and gives us Brosnan’s best outing since GoldenEye.